Inside Golf, Australia's leading Golfing print magazine publication, published a review of PNP's SiteLine Putter and Chipper. Having played golf for over 40 years, I’ve seen and tested nearly every new type of club on the market. While many of these products can easily fall into the “gimmick” category, there are a fair number of clubs that are the “real deal”, offering massive benefits to golfers of all levels. An even smaller subset of these can be classified as a real “game changer”, offering something so unique that it can actively help a population of golfers to really reduce their handicap, and improve their enjoyment of the game. A new product line on the market, the PNP SiteLine Putter and Chipper line, sits firmly in that second category. Now, many golfers out there are hesitant to add a “chipper” club to their bag, whether it’s due to the thought of the perceived sledging from playing partners, or simply indecision of which of the 14 clubs in their bag should be relegated to the storage closet in favour of this new club. To be honest, I fell into both categories. But after a few rounds with the SiteLine clubs, I was absolutely hooked. The benefit of using a chipper is that it allows you to hit low-lofted, bump-and run shots from a variety of places near or around the green. Whether you need to clear a section of furry fringe near the green, pop over a small obstacle like a sprinklerhead, or simply hit a greenside shot from a very tight lie, a chipper has many unique advantages. While some players will opt to hit, say, a hybrid or wedge in these situations, the truth is that a hybrid’s shaft is often too long for a controlled, “touch” shot around the green, while the face can sometimes lead to inconsistent results. Wedges, on the other hand, can dig into the ground (leading to the nasty “chunk” shot) or can bounce off a tight lie, leading to a skulled shot. And a putter from well off the green can result in unexpected “kicks” off uneven turf or unseen obstacles. The SiteLine clubs put an end to all that. 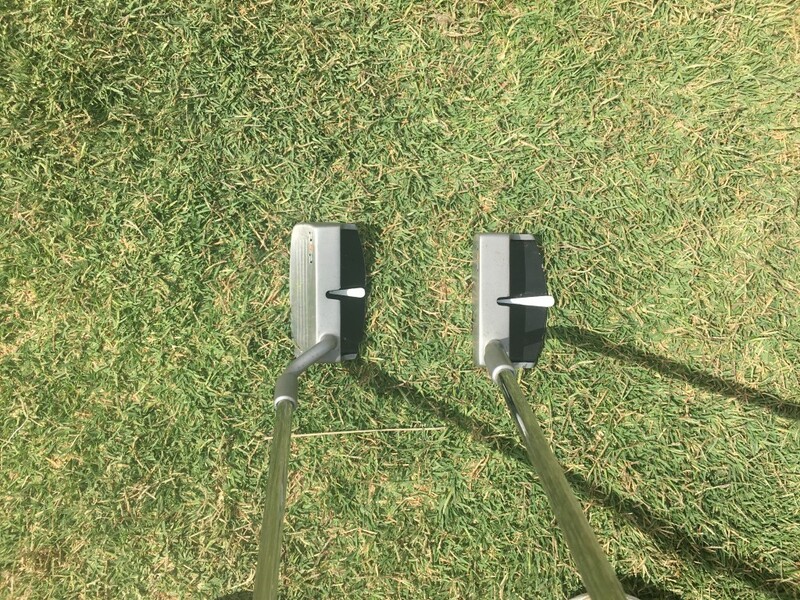 The secret to the SiteLine Putter and Chipper line is that they work together as a “Dynamic Duo”. Both clubs use a unique “All Square” alignment feature. Simply address the ball, and make sure that the directional pointer fits squarely in the notch on the top of the club. This ensures, every time, that your eyes are directly over the ball and that the putter face is 90° to the target direction. Easy peasy. But here’s the key (and this is absolutely critical, so pay attention): As these two clubs are designed as a set, you can use the SAME STROKE for both putting and chipping. This develops into a repeatable muscle memory, and all but guarantees consistency (and confidence). So, playing a long “chipper” shot uses the exact same stroke as a long putt (albeit with a longer backswing, etc). It’s a brilliant idea, and is sure to turn heads. The SiteLine chipper features an anti-dig, flat sole, which glides across the ground for consistent contact. With a loft of 35° (Similar to a modern 8-iron) it’s designed for shots under 60 metres, but can be hit from a variety of distances (even full swings!) For shots under 30 metres, you use your regular putting stroke and grip, resulting in a lower shot with more roll. For shots longer than 30 metres, use your normal iron/wedge grip (with hands leading the clubhead) which gives you a higher trajectory and more backspin. In truth, the SiteLine chipper is becoming my “Magic Wand”—and I find myself using it for more and more shots (to great success). As mentioned, the key is to use the SiteLine Chipper and Putter in concert to develop a repeatable swing. The SiteLine Putter has a small, face-balanced mallet head and is made from 17-4 S/Steel, a malleable compound that gives a soft feel and good feedback through the stroke. It is designed to be used with a pendulum putting stroke—simply back and forth, and can be used no matter how you grip the club. Both clubs come in standard club length of 34.5”, with oversize grips, the latest game-improvement craze sweeping the golf world. All told, this “Dynamic Duo” is a remarkable combination of clubs, and they now sit proudly in my bag. I have no fears about sledging from my fellow playing partners regarding the chipper, as by the end of the round, they are usually asking me where they can get one of their own!